Here's the problem. You have to combine two amplifiers, and connect them to an antenna. You don't know what the antenna VSWR will be, but it won't be a perfect match, let's assume 2.0:1. And you have no idea what the angle of the reflection coefficient will be. The quick answer many people come up with is that you will lose ~0.5 dB due to mismatch. This would be true in a small-signal case, but in large-signal, the amplifiers are subject to load-pull which can give unexpected results. We'll give you the conclusion to think about while you read on... the best choice is the quadratur coupler, it will be more forgiving than the Wilkinson, but not for the reason that most people assume. The isolation load on the fourth port doe not absorb the mismatch, the reflected power comes back to each amplifier in all its glory, but at different phase angle! The text and images below came from one of our favorite message board citizens, Madengr! 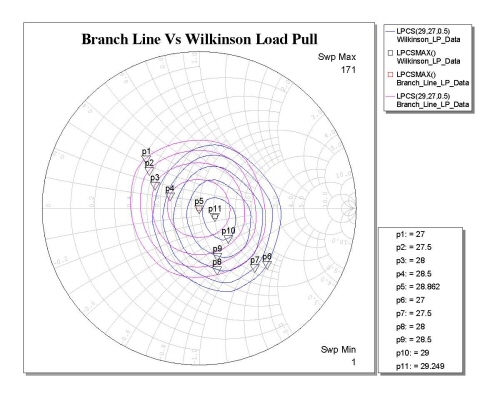 When paralleling two power amplifiers, does the Wilkinson or Branch Line topology yield better performance against load pulling? 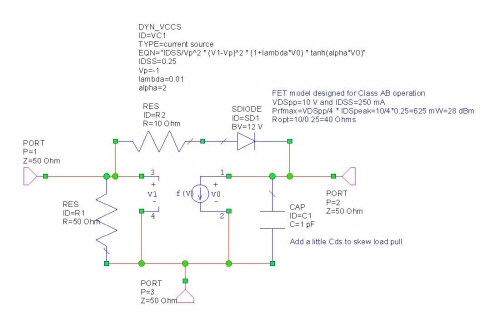 A simple FET model was created. It should deliver a maximum of 28 dBm into approximately 40 ohms however output capacitance was added to skew the maximum power match off the real axis. The FET was used in an amplifier. Output matching could be added here but it is desired that the optimum load for the amp should not be 50 Ohms. 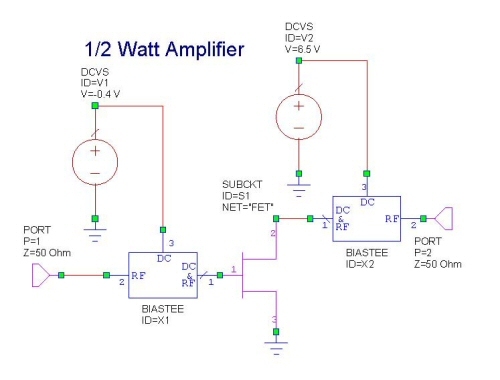 The amplifier was driven by 3 dBm and terminated with 40 Ohms. The dynamic load line shows class A operation; the load line runs between maximum current at the knee to almost zero current at gate-drain breakdown. 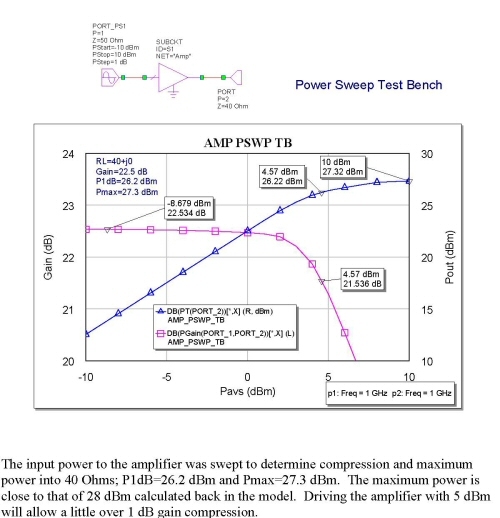 The input power to the amplifier was swept to determine compression and maximum power into 40 Ohms; P1dB=26.2 dBm and Pmax=27.3 dBm. The maximum power is close to that of 28 dBm calculated back in the model. Driving the amplifier with 5 dBm will allow a little over 1 dB gain compression. As drive power is decreased the optimum load resistance must be increased to obtain maximum power (keeping the load line swinging between the knee and breakdown). 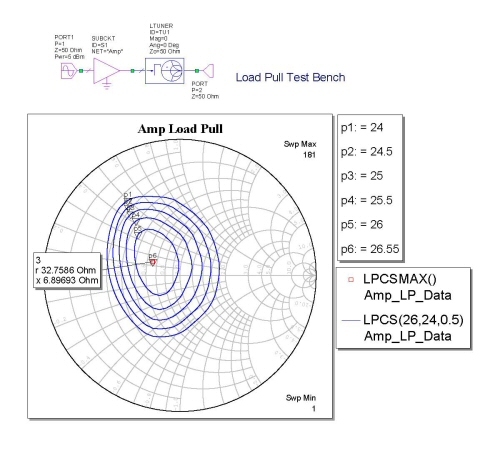 Conversely, driving the amp harder requires a lower optimum load resistance to obtain higher peak current. Two amplifiers were combined with Wilkinson networks and load pulled with 8 dBm drive. The combination achieves 29.2 dBm (marker p12) which is 0.3 dB below the desired 29.6 dBm, however the optimum load impedance has changed. 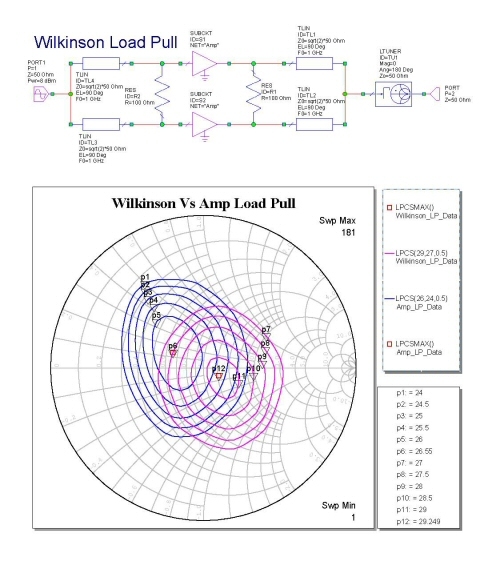 If the Wilkinson network were terminated with the optimum load for a single amplifier the output would only be 27.5 dBm (contour p8). I added some 180 degrees lines in the network to make sort of a push-pull combination and there was no change in the contours. Two amplifiers were combined with Branch Line networks and load pulled with 8 dBm drive. The combination achieves 28.9 dBm (marker p11) which is 0.7 dB below the desired 29.6 dBm however the optimum load impedance is now exactly 50 Ohms. 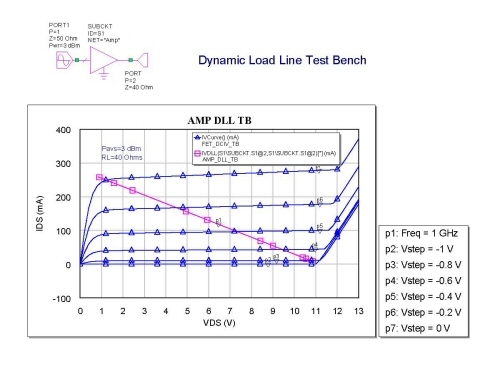 If the Branch Line network were terminated with the optimum load for a single amplifier the output would be 28.5 dBm (contour p10), which is 1 dB more than the Wilkinson. The Branch Line allows the combination to deliver maximum power into 50 ohms, however this maximum power will always be less than twice the maximum power of the individual amplifiers. The Wilkinson would allow tuning to achieve the maximum power of both amplifiers. 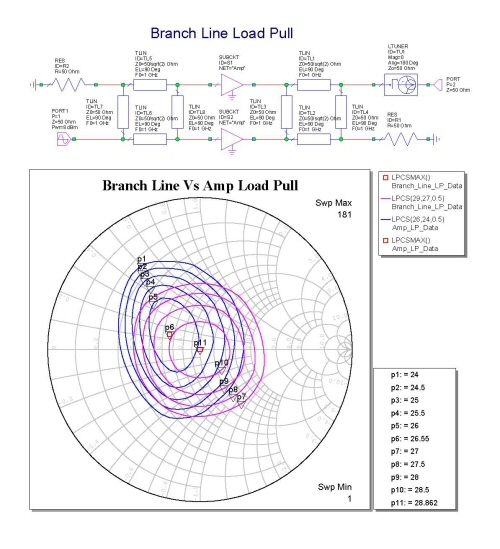 The bottom line is, if you have two amps identically tuned up for slightly less than 50 Ohms optimum load impedance, you will get more power out with the Branch Line topology. The Branch Line also allows for more power into a wider mismatch, at least that's the way it seems from the area of the contours. The simulations need to be re-run with the amplifiers properly matched. It would also be interesting to set different Cds for each leg. The Branch Line may not have as much advantage in this case.